Q: We have learned that Qatari Foreign Minister is in China for a visit. Can you confirm it? What is the purpose of his visit? What meetings are planned for him? What is China's proposal for a way out of the current wrangle among Gulf states? A: Qatari Foreign Minister Mohammed is in China for a working visit. This afternoon, Foreign Minister Wang Yi will meet and exchange views with him on bilateral relations and regional and international issues of mutual interest. It is the common interest of the regional countries and the international community to ensure stability of the Gulf, solidarity of the Gulf Cooperation Council (GCC), and concerted efforts of all Gulf countries against terrorism. Yesterday, while meeting with the visiting UAE Minister of State Sultan, Foreign Minister Wang Yi raised three points on resolving the Gulf crisis. The first is to support political and diplomatic settlement as a broad direction, and all parties shall follow the basic norms guiding international relations and fulfill their due international obligations. The second is to support an Arab way of resolving the current differences within the framework of the GCC. The principles of mutual respect and non-interference shall be upheld, and non-regional countries shall contribute in a constructive way to realize reconciliation. The third is to support all parties to sit together and have dialogues at an early date. Flexibility is needed. An agreement could be reached first on the goal of opposing all forms of terrorism, after which efforts shall be taken step by step to settle other differences. Q: With regard to the China-US Comprehensive Economic Dialogue yesterday held in Washington, how will this Dialogue affect bilateral relations? Will recent diplomatic cases, like the US arms sale to Taiwan, its maneuvers in the South China Sea, and sanctions on Chinese companies and individuals because of the Iranian nuclear issue, impede bilateral economic and trade cooperation? A: As I said yesterday, in accordance with the consensus reached between the two leaders, on July 19, the first round of China-US Comprehensive Economic Dialogue was held in Washington, the US, co-chaired by Vice Premier Wang Yang of the State Council and US Treasury Secretary Steven T. Mnuchin and Commerce Secretary Wilbur Ross. 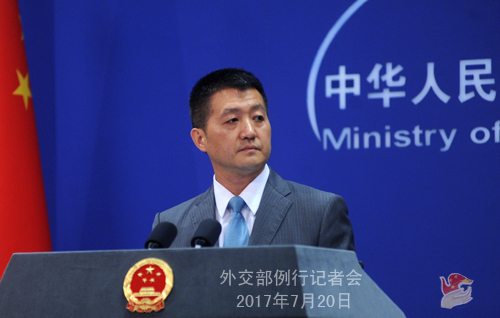 China and the US have released relevant information, including detailed account of their dialogues. You can refer to that. The two sides held in-depth discussions on China-US trade and investment, the 100-Day Plan and One-Year Plan for economic cooperation, global economy and governance, macro-economic policy and finance, and agriculture. Extensive consensus was reached. The two sides also agreed to cooperate constructively on narrowing trade deficits. The two sides agree that this round of dialogue was innovative, pragmatic and constructive, the most important achievement being setting a right direction for China-US economic cooperation. That is the two sides should uphold win-win cooperation as a basic principle for developing bilateral business ties, take dialogue and consultation as basic methods to resolve differences, and sustain communication on major economic policies as a fundamental way of carrying out cooperative dialogues, which laid a solid foundation for future cooperation. I said that the US Treasury Department also released relevant information. Treasury Secretary Mnuchin and Commerce Secretary Ross spoke highly of the positive progress achieved by bilateral economic cooperation in some important areas since the Mar-a-lago meeting, especially since the announcement of the 100-Day Plan. They expressed that the US stands ready to work with China to implement the important consensus reached between the two leaders. 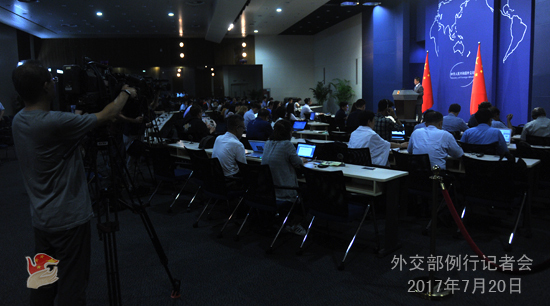 As for your second question, in response to these issues besetting China-US relations as a result of the erroneous steps the US has taken on issues concerning China's core interests, whether it is the Taiwan-related issue, or the "long-arm jurisdiction" imposed on Chinese enterprises, or maritime issues, we have made our positions clear. I sense that your logic is that the development of China-US relations depends on the two sides working together towards the same direction. A China-US relationship that grows in a sound and steady way serves the common interests of the two sides. All the wrong moves taken by the US on relevant issues, as you enumerated in your question, are not conducive to sustaining a favorable environment for China and the US to carry out mutually beneficial cooperation. Q: You talked about Qatari Foreign Minister's visit to China. The past week has also seen visits of the Palestinian President, the Tunisian Foreign Minister, and the UAE Minister of State, which gives a feeling that China is very active on the Middle East issue. What is China's consideration behind these active interactions with Middle East countries? What messages does China want to send? What role is China intent to play? A: The situation in the Middle East is now at a crossroad. When the Middle East is unstable, it will be difficult for the world to enjoy peace. As a permanent member of the UN Security Council, China always have regional peace, stability and development at its heart. When we approach the Middle East issue, we harbor no self-interest. We do everything out of the wellbeing of regional countries and people. We received Palestinian President Abbas, Tunisian Foreign Minister Jhinaoui, UAE Minister of State Sultan, and Qatari Foreign Minister Mohammed, because we want to strengthen our coordination and cooperation with regional countries at this special occasion to promote peace talks. We would like to work with the international community so that the situation in the regional will move towards the right direction. The Palestinian issue is at the root of the Middle East issues. Peace and development of the whole region depends on the just and proper settlement of the Palestinian issue. When meeting with Palestinian President Abbas, President Xi Jinping proposed four points on how to move forward the settlement of the Palestinian issue in light of the new circumstances. A political settlement must be found on the basis of two-state solution; A security outlook that emphasizes common, comprehensive, cooperative and sustainable security must be adhered to; International efforts shall be better coordinated to seek great synergy; A holistic approach must be found to promote peace through development. President Abbas spoke highly of President Xi Jinping's constructive proposal and voiced his support. While meeting with the visiting UAE Minister of State Sultan, Foreign Minister Wang Yi raised three points on resolving the Gulf crisis. This afternoon, Foreign Minister Wang Yi talked with Qatari Foreign Minister Mohammed, saying that China will promote peace talks and help resolve the Gulf crisis in accordance with the needs of the Arab states. Foreign Minister Wang Yi also raised a four-point principle China sticks to on resolving the Libya issue when meeting Tunisian Foreign Minister Jhinaoui. All the afore-mentioned proposals have been echoed positively by relevant parties. Going forward, China will continue with its constructive efforts to alleviate regional tension and promote regional peace and stability in response to the need of regional countries. Q: A follow-up on the question of China-US talks. US officials had just said that there was no new progress made in the pressing trade concerns. Both sides canceled their press briefings in Washington. There were some criticisms from US business lobbies that the talks have fallen short of expectations. I was wondering your responses to these criticism that the talks had fallen short? A: I said that the US Treasury Department released relevant information. If you read carefully information and remarks made by China and by US Treasury Secretary Steven T. Mnuchin and Commerce Secretary Wilbur Ross, you will not believe that the US thinks this round of Dialogue is negative. In fact, the US said during the Dialogue that the Comprehensive Economic Dialogue, established at the consensus between the two leaders in Mar-a-lago, is an important measure to promote bilateral business ties. The US also agreed that this round of Dialogue shall not only focus on specific trade issues, but also set eyes on long-term strategic challenges. The US also made clear that as the two largest economies and important engines driving global economic growth, China and the US share a wide range of common interests and should work together to maximize such interests and develop bilateral business ties in a fairer, more balanced, and more sustainable way. As for the imbalances that have occurred in different times amid China-US economic ties, just like we have said in the 40 years since the establishment of diplomatic ties between the two sides, the bilateral trade volume has increased from several billion dollars at the beginning to almost 600 billion dollars today. Such expansion could not have happened if such cooperation did not bring enormous benefits for the two sides and were not mutually beneficial in nature. Therefore, we believe that as long as the two sides can work together towards the same direction, pursue business cooperation in the spirit of mutual benefit and win-win results, resolve differences through friendly consultations, the prospect for China-US business cooperation will be extraordinarily bright. Q: The Asia Financial Cooperation Association (AFCA) was set up in May. We've heard that the AFCA will hold a ceremony in the coming days. Do you have more information on that? A: China is committed to enhancing communication and cooperation between regional financial institutions. On March, 2015, President Xi Jinping raised the idea of setting up the Asia Financial Cooperation Association at the annual meeting of the Boao Forum for Asia, after which this initiative was repeated many times by Premier Li Keqiang. We are glad to see that financial institutions in Asia and other regions are very supportive of this initiative and have responded positively. As one of the outcomes of the Belt and Road Forum for International Cooperation, the AFCA was officially established on May 11 and headquartered in Beijing. So far, it has attracted 107 institutions from across five continents as its founding members. On July 24, the founding ceremony of the AFCA will be held in Beijing. China expresses its congratulations. We hope that the AFCA will uphold the principle of "connectivity, cooperation, joint governance, shared benefits" and play a constructive role in ensuring stability of the regional and even global financial market and in promoting common development and prosperity of the region. Q: In the Chinese statement, it mentioned a one-year economic action plan. I wonder if you can offer more details on what that is. Also, Indian officials said that India and China are holding talks to prevent the current border standoff from escalating. Could you confirm that? A: On your first question, during the Mar-a-lago meeting, the two sides agreed on the 100-Day Plan to promote China-US business ties. Today, this pan has made significant progress. On this basis, the two sides agreed that they should not only focus on resolving specific economic issues, but also plan for long-term strategic challenges by accumulating outcomes and enhancing cooperation. The two sides are seeking a cooperation plan that lasts longer than the 100-Day Plan, which was discussed in the just concluded first round of China-US Comprehensive Economic Dialogue. The two sides talked about some specific cooperation areas and reached consensus on seek early harvests of the One-Year Plan. On your second question, we have said multiple times that the facts and nature of the incident on the Sikkim section of the China-India boundary is very clear, which is that the Indian border troops illegally trespassed into China's territory. 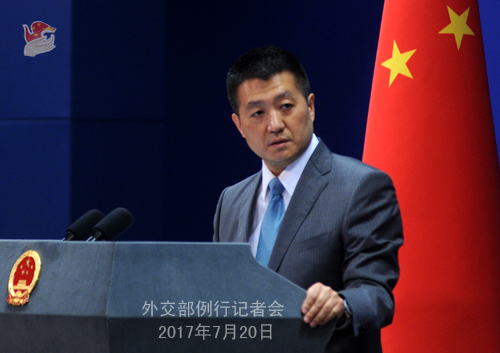 We keep saying that the diplomatic channels between China and India are unimpeded, but we also reiterate that the withdrawal of Indian border troops who illegally crossed into China's territory is the prerequisite and basis for any meaningful dialogue between the two sides. Q: According to reports, the Cambodian government has detained more than 30 telecom fraud suspects, of which 7 are apparently from Taiwan. I was wondering if you can confirm that and say China has requested those suspects be sent to the mainland? Secondly, there are reports that Egyptian officials have imprisoned several dozens of Chinese. Can you give more details? A: On your first question, we support the Cambodian government in carrying out law enforcement activities in accordance with its domestic laws. On your second question, as my colleague has said, we are following the development of the relevant situation. Consular officials from the Chinese Embassy in Egypt have paid consular visits. We consistently ask Chinese citizens overseas to abide by the laws, regulations and rules of the countries they reside in and not to engage in activities that do not suit their residence status. As announced last week, the promotion event for Inner Mongolia will be held here tomorrow at 3:30 pm themed Open China: Magnificent Inner Mongolia Inviting Friends around the Globe. Foreign Minister Wang Yi will address the event. The Party Secretary of the Inner Mongolian Autonomous Region Li Jiheng and chairperson Bu Xiaolin will respectively deliver speeches and presentations. Foreign diplomatic envoys and representatives will also be invited to make remarks and interact with other guests. We look forward to your participation in and coverage of this event. The regular press conference of the Foreign Ministry will be adjourned tomorrow. The Office of the Foreign Ministry Spokesperson's Office will take phone calls and faxes as usual.